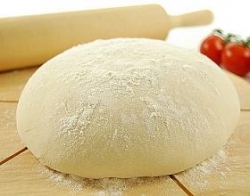 Pizza dough that is… and who doesn’t love pizza?! In honor of Fat Tuesday, the 2 kitchens will make far more than an appropriate amount of pizza for two people. And eat all of it. Check back later this week for our favorite topping combinations and technique tips! This entry was posted in Bread, Pizza, etc.. Bookmark the permalink.